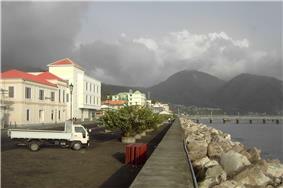 Roseau (parish and surrounded by the Caribbean Sea, the Roseau River and Morne Bruce. Built on the site of the ancient Kalinago Indian village of Sairi, it is the oldest and most important urban settlement on the island of Dominica. 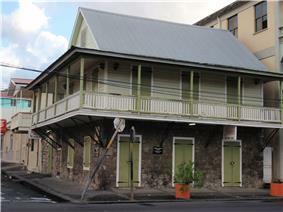 It is located on the west (leeward) coast of Dominica, and is a combination of modern and colonial (French Style) architecture. The city of Roseau sits on an alluvial fan formed hundreds of years ago as the river after which it was named meandered across the area from what is now known as Newtown to its current location. Over the last two thousand years, Amerindians migrating through the islands settled the area attracted by the nearby river. With the arrival of the Europeans on the island in the 16th and 17th centuries, a small settlement was established by the French who in their tradition of naming places after what they found there named the settlement with their name for the river reeds which grew along the river banks. A plan was created for the settlement which mirrored examples in France where streets extended from a central point at what is today the Old Market and extended out to the rest of the settlement. Conflict raged between the French and the British over the area on several occasions. Finally, the British gained a stronghold and by the late 18th and early 19th centuries set out plans for the city which included fortifications and government structures, the grid road street system and blocks and new urban areas to the north and south known today as Potter's Ville and Newtown. Goodwill was established in the 1950s and Bath Estate in the early 1980s. Since then several new semi-urban settlements — such as Stock Farm, Castle Comfort, and Wall House — have been constructed around the existing ones. 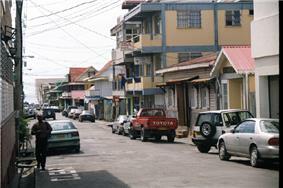 Some older settlements like Fond Cole and Canefield nowadays belong also to the semi-urban area that lies around Roseau. The French influence can still be seen today, however, in its architecture, and crooked streets which extend from the Old Market Plaza. Examples of the English influence is also evident in architecture and street names. Morne Bruce provides panoramic views of most of downtown Roseau and northwards toward Woodbridge Bay deepwater port and Fond Cole. From Morne Bruce there are also views of the Botanic Gardens at its base as well as the Caribbean Sea which look quite spectacular on cruise ship days when several cruise liners are in port. Roseau's climate is a tropical rainforest climate Roseau features relatively constant temperatures throughout the course of the year with average high temperatures generally between 28 and 31 °C (82 and 88 °F) and average low temperatures between 19 and 23 °C (66 and 73 °F). Rainfall is common throughout the course of the year, with the city seeing on average nearly 2,000 mm (79 in) of rain per year. Roseau features a noticeably drier stretch from February through April, though each of these months on average still sees at least 100 mm (4 in) of precipitation. The central district of Roseau is tightly packed with small and large houses and even larger modern concrete structures. There is little green or open space situated within the city, and this is even more so today, as many of the courtyards which was once commonplace within the city are giving way to office space. The district is, however, framed in every direction by natural elements. The sea and the river provide water element while the Botanical Gardens and the Government House gardens frame the city with green space. Both these elements are rare in the Caribbean. No other centre in the region has such extensive botanical gardens with such central location, and the Roseau River is amongst the largest rivers that flow through any Caribbean capital. The urban structure of Central Roseau is based on an irregular grid system of miniature proportions, making it a highly illegible city. Even though the grid area is not very extensive, it is relatively easy for a visitor to get lost there. The grid area has some 80 blocks in the area of 30 hectares (74 acres). In comparison, the grid areas of Kingstown and Castries — capitals of Saint Vincent and Saint Lucia — have some 50 and 60 blocks in the areas of over 40 ha (99 acre). The average block size in Central Roseau is thus some ⅓ hectare (1 acre), i.e. about half of the figure of Central Kingstown. There are some fine examples of West Indian architecture in Roseau. The ones that stand out the most are the French Colonial style and the vernacular form. Much of the French influence can be found along King George V Street. Around the city you will come across some good examples of the English influence in the form of large colonial town houses and colonial public/government buildings. The churches in Roseau are fine examples of Europe in Dominica with a bit of creolization. The Roman Catholic Cathedral stands prominent in Georgian style. Amongst these buildings you will find much of the urban vernacular squeezed in between larger colonial and more modern buildings. Because of the suburban sprawl, few people live in Central Roseau, but more of them commute daily. Motorized vehicles pour into the central district thus introducing a mode of point-to-point interaction in an environment that was created for multiple use. As elders said, first there were no streets but just a space between the buildings. The streets of Roseau, and especially those of its central district, are not only ways to move from place to place but they are places themselves. They are used as gardens, playing fields, and social meeting places. Within the city of Roseau, there are many opportunities for recreation. Many persons seek out the tranquility and cool of the Botanical Gardens as a getaway on Sunday afternoons and at lunch. As well, it is a popular venue for local cricket matches and sports training. Football is a popular sport; there are several pitches throughout the city area (at Newtown, Potters Ville, and Bath Estate), as well as in the sports stadium at Windsor Park. There are dedicated sports facilities around the city. Private tennis courts are located on High Street; netball and basketball courts also abound in the city's major high schools. These are complemented by community facilities at Goodwill. A dedicated netball and basketball stadium is located at Stockfarm near the Dominica State College. In 2007, Windsor Park, also home to the Dominica national football team, was completed with a donation of EC$33 million from the government of the People's Republic of China. Elsewhere in the city it is not uncommon to find that a section of the street, sidewalk or even the beach has been adapted to makeshift games of cricket or football. There are no world famous hotel chains in the city. The most famous hotel is the Fort Young Hotel. In addition there are several small family owned establishments within and on the outskirts of the city. Dominica Broadcasting Corporation, the national radio station, and two other private radio stations are located in the capital. The Dominica Association of Industry and Commerce, Waitukubuli Eccological Foundation, Dominica Tourism Association and others are based in the city. The city is served by Canefield Airport, a nearby small aircraft airport which provides direct links to nearby islands, as well as the larger Melville Hall Airport to the north. 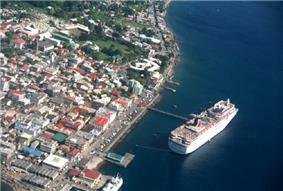 The ferry terminal provides direct links to the neighbouring Guadeloupe to the north and Martinique and St. Lucia to the south. Roseau has been the historical centre of education on the island. There are six secondary schools located in the city as well as eight primary schools. A community college - The Dominica State College is also located in Roseau. A private medical school, All Saints School of Medicine, also calls Roseau home. Several embassies are also located in the city. Among them include the Brazilian Embassy, the Chinese, the Cuban embassy, and the Venezuelan Embassy, with a couple of other consulates located around the city. Dame US invasion of Grenada in the 1980s.